Business success today requires a new depth of customer insight. Learn how the right blend of customer-centric strategies and advance analytic tools can help your business achieve advantage, including: Customer acquisition focused on attracting the right customers efficiently; relationship development strategies based on customer interests and propensity to purchase; customer value and satisfaction–based retention strategy; operational excellence achieved by acting on customer insight; and product leadership based on delivering products customers want. 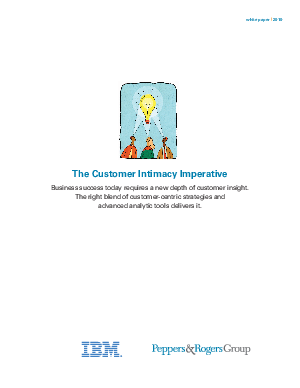 Read this white paper to realize the full potential of your customer relationships.